Dhanteras is the first day of the five-day Diwali Festival. Dhanteras Festival, also known as "Dhantrayodashi" or "Dhanwantari Triodasi". To mark the auspicious day, houses and business premises are renovated and decorated. Entrances are made colorful with traditional motifs of Rangoli designs to welcome the Goddess of Wealth and Prosperity. To indicate her long-awaited arrival, small footprints are drawn with rice flour and vermilion powder all over the houses. Lamps are kept burning all through the nights. 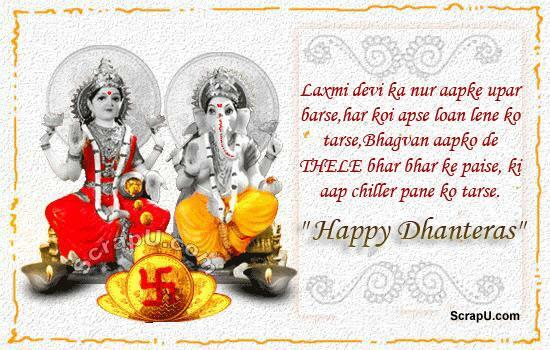 Your friendship has filled a golden gleam in my life..missing you very much this dhanteras! Happy Dhanteras.